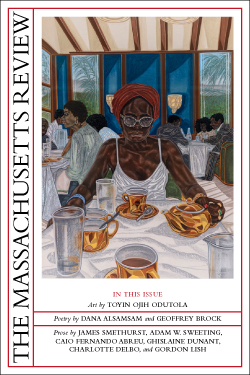 Welcome to the website of the Massachusetts Review (“MR”) published by Massachusetts Review, Inc., on the University of Massachusetts Amherst campus in Amherst, Massachusetts. Please read the following terms and conditions of use (the “Terms”) carefully before using this website. These Terms govern your use of MASSREVIEW.ORG (the “Site”) and is binding between you and MR. These Terms also apply to MR content which may be found on many social media platforms such as Facebook and Twitter (collectively this Site and these other platforms are the “MR Platforms”). We may modify, add to, or delete portions of these Terms at any time by posting updated Terms and any modifications, additions, or deletions to these Terms will become effective immediately upon posting, although any changes will only take effect prospectively, from the date of the change. You agree that your continued use of the MR Platforms following the posting of updated Terms indicates your consent to those changes. Please note that these Terms do not apply to any other website operated by or under the authority of the University of Massachusetts but only to the MR Platforms. The MR Platforms are made available to you solely for informational, educational, and noncommercial use. You may not use any content from the MR Platforms for any commercial purpose unless you obtain our prior written consent. See Paragraph 2 for how you may obtain reprints or classroom copies. Any content you access via the Site is made available subject to the limitations set forth in these Terms. The MR Platforms, including both the editorial content and the code used in programming of the MR Platforms, are protected by U.S. and international copyright laws. You are granted a limited license to access this content solely for your non-commercial use. You may not access this Site for competitive purposes or to otherwise mine data about our products and services or our subscribers or others that access the MR Platforms. Except as explicitly provided in these Terms, you may not reproduce, distribute, transmit, display, prepare derivative works, perform, or use in any other way that is prohibited by copyright law without consent of the copyright holder, any copyrighted material found on the MR Platforms. You may obtain reprints of articles from MR by following the guidelines set out in Sub-Rights/Permissions. Any use of reprints is conditioned on the inclusion of notice on the reprint of MR’s copyrights to the material and state that the reprint is used with MR’s permission. You also are obliged to comply with any other limitations that maybe included with the reprints. The Massachusetts Review name and the MR logo are trademarks or service marks of Massachusetts Review, Inc. Massachusetts Review, Inc., reserves all rights to these marks. You may not use any of the MR marks, logos, or graphics without the prior written consent of Massachusetts Review, Inc. All other trademarks and service marks appearing on the MR Platforms are the property of their respective owners, and should be used only with prior written consent from the appropriate owner. The MR Platforms may contain links to sites and services, and use embedded tools provided and controlled by third parties and governed by the terms of service of those third parties. MR is not responsible in any way for third party sites, services, or products that may be linked to, embedded in, featured on, or otherwise used via the MR Platforms or for any products or services that may be advertised by third parties thereon. The Massachusetts Review, Inc., does not endorse the content, operators, products, or services of these providers, and users should review these providers’ own terms of service for more information. You may only use the MR Platforms for noncommercial purposes. You may not use the MR Platforms to distribute or otherwise publish any material containing any solicitation of funds, advertising, or solicitation for goods and services. The MR Platforms are intended for users over the age of 13. Massachusetts Review, Inc., may delete, edit, or move any user-generated material that we believe may be objectionable or in violation of these Terms or for any other reason in our sole discretion. Massachusetts Review, Inc., may limit or terminate users’ access to the MR Platforms for any reason, including violation of these Terms. Please note that for purposes of this section, user generated content does not include materials formerly published by MR in its journal. If you participate in any discussions or leave comments on the MR Platforms you agree to the following additional rules. Please stay on topic. If you have general questions or concerns about or with MR, please use our contact page. MR welcomes your thoughts, but may remove or edit comments at our discretion, including for excessive length. Submissions must be civil and respectful. Hateful, harassing, or discriminatory language will not be tolerated on the digital platforms. Massachusetts Review, Inc., may delete any content that contains foul language, or may be otherwise inappropriate, without warning. In the case of repeated offenses, Massachusetts Review, Inc., may terminate your posting privileges. You may only post, upload, or transmit materials for which you own the copyright or have permission to distribute electronically. This includes newspaper or magazine articles, song lyrics, audio, video, photos, and images. You may not violate, plagiarize, or infringe the rights of third parties, including copyright, trademark, trade secret, privacy, personal, publicity, moral, or proprietary rights. Except as noted below, by posting, uploading, or transmitting any material on or through the MR Platforms, you hereby grant Massachusetts Review, Inc., a non-exclusive, irrevocable, sublicensable, perpetual, royalty-free, worldwide license to use that material in any form or media now known or hereinafter developed. Our rights to material you post or transmit on the MR Platforms include the right to use such content in advertising or promotions without any payment of any kind to you. This provision does not apply to any submission made via the Site for consideration of material for publication. You may not link to, post, upload, or transmit any software or other material which contains a virus or other harmful or malicious code. You may not use the MR Platforms to distribute chain letters, mass mailings, or spam or to gather e-mail addresses for the purpose of sending spam to other users of the MR Platforms. Written Submissions: You may submit materials to MR via the Site or by snail mail. By submitting this material you are representing and warranting that you own all rights to the materials being submitted and that no third party consent or payment is necessary for MR to publish the material. Specifically, you represent and warrant that any work you submit for publication is original and not copied from any third party. Other Materials Submitted to MR: Except for written submissions for publication, any communication you make with us via the MR Platforms will be treated as non-proprietary. Massachusetts Review, Inc., is free to use any idea, concept, or invention created by you and transmitted to it via the MR Platforms notwithstanding any limiting language you may use when transmitting such information. If you do not want us to use your idea unless we pay you a fee, or agree to other terms, do not transmit it to us via the MR Platforms. You represent and warrant that any material you post, upload, or transmit on or through the MR Platforms (a) does not violate any intellectual property rights of any third party, (b) does not and will not violate any of these Terms, (c) your use of the MR Platforms complies with these Terms. You agree that you will indemnify and hold harmless Massachusetts Review, Inc., and its directors, officers, employees, and licensees from any and all claims, liabilities, costs, or expenses, including reasonable attorneys’ fees, arising from (1) your breach of any of the above representations and warranties, (2) your wrongful use of the MR Platforms, (3) the materials you have posted, uploaded, or transmitted on or through the MR Platforms, or (4) Massachusetts Review, Inc.’s publication, distribution, or use of such materials. The MR Platforms are available on an “as is” and “as available” basis, without any warranties of any kind, either express or implied, including warranties of title or implied warranties of merchantability or fitness for a particular purpose Massachusetts Review, Inc., does not warrant that the MR Platforms will be uninterrupted or error-free. Massachusetts Review, Inc., also does not make any warranties as to the results that may be obtained from use of the MR Platforms or as to the accuracy, reliability, or content of any information, service, products, opinions, or statements available on or through the MR Platforms or through links thereon. Use of the MR Platforms is entirely at your own risk. In no event will Massachusetts Review, Inc.,, its directors, officers, or employees be liable for any indirect, consequential, special, incidental, or punitive damages, arising out of the use or inability to use the MR Platforms. In no event will Massachusetts Review, Inc., its directors, officers, or employees be liable for any amount in excess of $100. Or by email at massrev@external.umass.edu. These Terms supersede any previous documents, correspondence, conversations, or other oral or written understanding related to these Terms. These Terms are governed by and construed under the laws of the Commonwealth of Massachusetts without regard to its choice of law rules, and, where applicable, the laws of the United States. To the extent permissible by law, any disputes under these Terms or relating to the MR Platforms will be litigated in the state or federal courts located, and you hereby consent to personal jurisdiction and venue, in the Commonwealth of Massachusetts. A modification or waiver of a part of these Terms will not constitute a waiver or modification of any other portion of the Terms. If for any reason any provision of these Terms is found unenforceable, that provision will be enforced to the maximum extent permissible, and the remainder of the Terms will continue in full force and effect. If you have any questions about these Terms, please contact massrev@external.umass.edu.